Linux Based for better security. LowcountryHosting is proud to forward $10.00 of the proceeds obtained from each of those accounts in the AMVETS web project as a rebate to aid their mission to help veterans who have, and do, so honorably protect our freedom. Why choose Lowcountry Hosting as your webhosting provider? 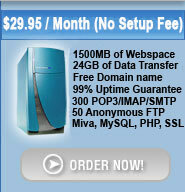 Looking for a webhost that will give you the space and bandwidth you deserve for your money. Tired of those home-based hosts that come and go? Lowcountry Hosting is a real "brick and morter" business equipped with the servers and internet connectivity that puts us ahead in the industry as a major website and hosting provider. We guarantee that our servers will never be overloaded or overcrowded. With Intel pentium core 2 duo servers, 2 GBs of DDR2 memory, RAID storage devices and redundant tier 1 internet connectivity we are able to handle millions of hits a day with no slow down. A 24 hour a day, 365 days a year control panel gives you the power to customize your account however you want to. And with multiple languages supported such as Perl, PHP, Miva, and MySQL databases, we allow you to expand your site in new ways to reach your audience. We can also save you money with features such as our reseller accounts for current customers and our refferal bonus. If you reffer a customer that signs up for an account equal to or greater than yours then you will recieve a free month of service. We also provide a 45 day money back guarantee. If for what ever reason you are not satisfied in the first month of service we will refund your payment. Try us out, you have nothing to lose! Extras including a free domain name! 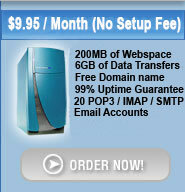 We also have many extras other hosting companies can't compete with. We offer free domain names (.com, .net, .org, .us, .biz, .info, and .ws) for every account, bypassing the usual fee other companies charge. As long as you remain our customer we'll pay for it. 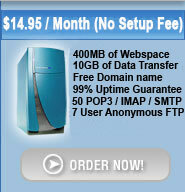 If you already have a domain name we can transfer it to our domain registrant, then we will pay for it. With no setup cost and reasonably priced packages, Lowcountry Hosting is dedicated to giving our customers value for their money. fall in love with our service risk free.